Take a good look. 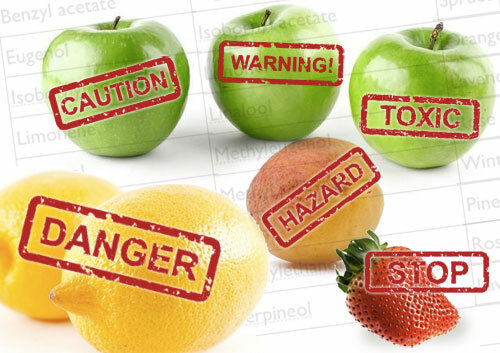 These fruits all contain possibly harmful and dangerous allergens and should be banned – or at the very least – come with warning labels so we can all be properly informed before deciding whether or not we want to ingest them or – heaven forbid –feed them to our children. These fruits (and many other fruits – and many vegetables) contain components that must by law be declared on the ingredients labels of cosmetics in Europe – because these very same ingredients also happen to be components of some essential oils. Take that innocent looking strawberry – it contains eugenol and benzyl acetate which you will also find present in ylang ylang and clove essential oil. Lemons contain limonene – also to be found in lemon as well as orange essential oil. The apricot is a veritable bomb of possible allergens: it has linalool, methyleugenol, terpineol and phenylethanol. These same ingredients are also found in the essential oils of lavender and rose. The apples contain phenylethanol and terpineol – also present in rose and lavender essential oil. It's perfectly legal (and acceptable) to sell fruit without labelling or warnings. Think of it. Have you ever seen a fruit stand offering allergen-free apples? Because apparantly these ingredients are safe as long as they are in food. And apparantly when they make their way into cosmetics, they must be declared on the ingredients label as possible allergens. In short, we can eat them without worry, but not put them on our skin for fear of possible allergic reactions. Shall we pause for a moment so that little tidbit of information can sink in? Nope, sorry, I'm still gobsmacked. Apart from being present in many fruits and vegetables, the essential oil constituents mentioned above are typically also found as part of the fragrance in cosmetics products. And we all know that fragrance equals allergies, right? I mean, studies have shown that these ingredients are accumulating in our bodies – all due to the fragrances in cosmetics ... right? "As far as the fragrant compounds are concerned, they are naturally found in some common foods (see Table), so that could be one reason that they are found in our bodies. Limonene and pinene are ubiquitous simply because so many trees produce them. If you have pine furniture, it will give off limonene and pinene vapors. If you have paint thinned with turpentine, same deal, because turpentine is made from pine trees. If you live near trees…basically, if you’re breathing, you are inhaling limonene and pinene." Below are the 26 ingredients that must by law be declared on the label of cosmetics in Europe. These 26 ingredients may also be present in the fruit and/or vegetables you eat every day – but don't worry – apparantly, they don't 'count' if they are in food. Have a safe and allergen-free day. Ref: Essential Oil and Fruit Comparison information from Robert Tisserands table graphic in this Post. I know what I am reading ... I think I need another moment to comprehend the information. Very funny - and very spot on! It would seem to me that it makes sense that isolating and concentrating something would make it much more dangerous than in its natural form. Yes lemons contain a lot of limonene in the skin, but when was the last time you ate lemon skins? Also you'd have to eat a lot to get the same concentration as used in cosmetics. So yes, this makes a lot of sense.